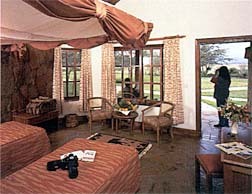 Deep in the heart of the world famous Amboseli National Park is the Magnificent Ol Tukai lodge. Lying at the foot of Mount Kilimanjaro and dotted with yellow barked Acacia trees and cream slate, Ol Tukai blends perfectly into the African savannah. Ol Tukai is the perfect location to bring out your naturalist instincts. Numerous animals are at home at the Amboseli National Park, elephant, rhino, lion, buffalo, cheetah, leopard, giraffe and gazelle. For the professional or amateur birdwatcher the Ol Tukai bird-walk offers a wide variety of bird species. Ol Tukai offers an unparalleled "return to nature" experience. Amboseli National Park is a great place to visit in its own right. The park is dominated by a partially dry lake bed of evaporated salts. Its landscape is dominated by Acacias and Phoenix palms. Each of the 80 twin rooms at the Ol Tukai are a study in luxury. Each room allows for an uninterrupted breathtaking view of Mt. Kilimanjaro and the wetlands. The furniture is well chosen to enhance its comfortable feel. When the day gets too hot and you wish to cool off, or if you just want to enjoy a swim, the Acacia tree shaded swimming pool offers welcome respite. The adjoining pool bar offers a wide range of snacks and drinks. The Elephant bar presents a unique menu for relaxation and enjoyment. In the open air bar you can sip your beer, a cocktail or fresh fruit juice as you watch elephants frolicking or grazing in the wetlands. The bar is open until the last guest retires, so if you are the knock-off-late type you might even see the stealthy leopard stalking prey. For those who prefer a quieter relaxation, one can read the day away from the well stocked library that has a beautiful view of Mt. Kilimanjaro. One could also relax in the cool lounge and play any of the wide choice of board games available. Speakers from the elephant research station located on the large grounds, give daily lectures too. At Ol Tukai you really step out into the wild side but you do not get out of touch. Ol Tukai has a 24 hour telephone service as well as a radio call service for passing telex and fax messages. There is a bureau de change that can convert any currency you might need. No place gets you closer to nature with such style as Ol Tukai.